I was a little nervous at first, but soon after, on the first day, everything became pretty comfortable. Rob made it a fun learning experience. 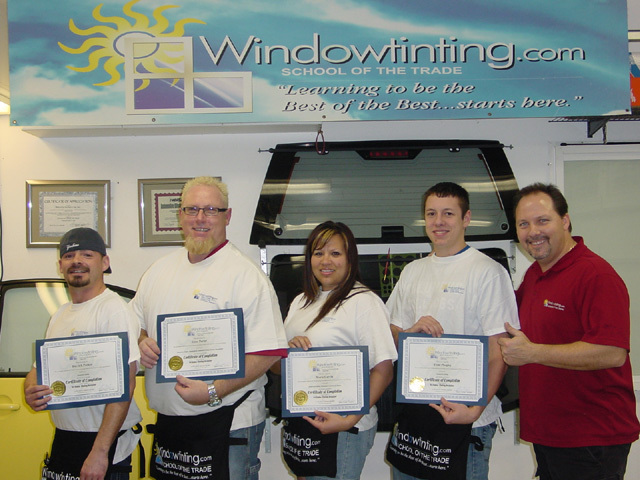 I would recommend his class to anyone interested in getting into the tint trade. I have NEVER had an instructor on any level of education teach like Robert. His "how-to" was immediately followed up with a "why-it-is" done that way; and either process proceeded with a demonstration. Explanations of the finest details were complemented by the book/training guides and tips. By far the best learning experience I have ever experienced…Period. Actually, being a girl, coming to this school, I was nervous; but once I got here, Robert was great at making me just one of the guys". I learned so much. Best decision I made. Thanks again!" I will definitely go back ready-to-tint and car with confidence.